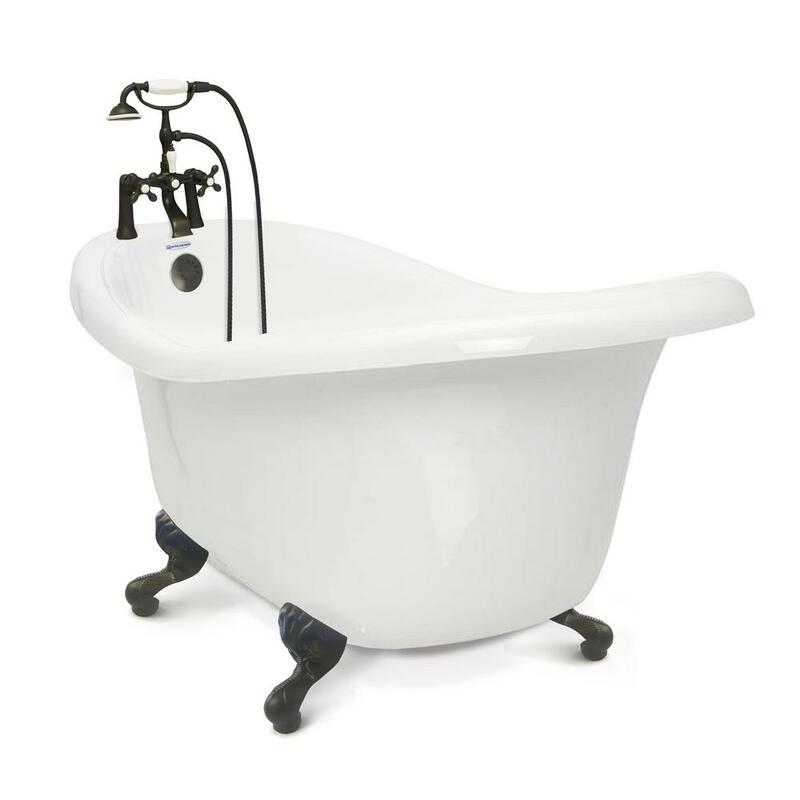 American Bath Factory presents the Chelsea Slipper Claw Foot Bathtub Packages. We offer the tub only or the complete kit which includes everything you need to transform your old bathroom from ordinary to extraordinary. The Chelsea Slipper tub is made from our proprietary material we call AcraStone, resulting in a bathtub to be beautiful and dependable for years to come. AcraStone is strong, thick and warm to the touch with a smooth porcelain like finish. The Chelsea Slipper bathtub features hand-cast metal Imperial claw feet that are available in White or you may upgrade to 3 other metal finishes (CH, SN or OB). The gentle slope allows the bather to recline comfortably for a more relaxing soak. 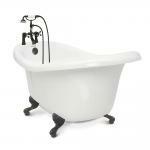 The tub is lightweight but strong which makes this perfect for your second story bathroom. Our tubs come backed with our Limited Lifetime Warranty. Size: 60 in. L x 32.5 in. W x 29.5 in. H soaking depth: 17 in. gallons: 40Material: Acrastone is strong (chip/wear resistant) with a porcelain-like surface Bathtub is pre-drilled for faucet. This is the Chelsea Slipper Clawfoot Bathtub Package C-OB which includes the 5 ft. Slipper tub with Old World Bronze Metal Imperial Feet, F900A Deck Mount Faucet, F1100 Straight Supply Lines and F5714 Waste and Overflow Tip Toe Drain in Old World Bronze.